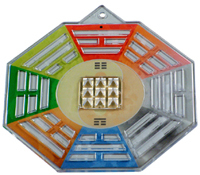 Energy plate is again a tool in Vastu which is used for correction as a remedy. Energy plate differs in colour and symbol which is engraved on it for specific purpose. These energy plates are known for their super natural power that one gets by installing in house. Energy plate is nothing but a scared talisman or amulet embellished and made with any of the treasures including gold, silver and copper. They have been used since ages as a pious treasure in the homes/living place to discard negative energies and help making it a prosper place. Energy plates are mainly placed in functional rooms such as bedroom, living room, study room, pooja room while kitchen, bathroom or toilet are not recommended for energy plates. Usually energy plates are placed before the main flooring is done and even during excavation energy plates are also used to energize the place. When energy plates are being placed under the floor from one room to other there is created a pyramid energy field that makes conditions favourable for overall bliss for inmates. The most scared symbol is Swastik which has been found on most energy plates and even homes & temples install it on their walls to keep the place energized and positive. This symbol had been a topic of debate and research among scientist from years and now even they are convinced with the majestic power of Swastik. Energy plates must be placed in proper direction to multiply the results and to achieve good luck. Therefore Vastu energy plates enable the inhabitants to get good health, wealth and prosperity with a positive surrounding.